The Rainbow Reacher is super-lightweight and all-plastic. Does not require wide grip span yet jaw opens wide! 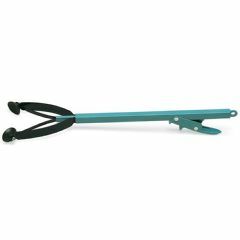 Easy for people with arthritis and limited grip strength to use. Light weight is also ideal for children. The jaws open to 4-1/2" (11cm) wide for one of the largest grasps of any reacher on the market. This was specifically purchased to use in the car, to reach things on the dashboard and floor. A longer reacher is awkward. I did note that it doesn't pick up heavy stuff, like I tried picking up a large orange, but that was too heavy; and it would probably have trouble with a can of vegetables. However, I bought it for lightweight stuff, so that's okay.